Grass carp reovirus (GCRV) is a tentative member of the Aquareovirus genus in the family Reoviridae. The mature virion comprises 11 dsRNA genomes enclosed by two concentric icosahedral proteins shells that is comprised of five core proteins and two outer capsid proteins. The genome sequence and 3D structure demonstrate there is a higher level of sequence homology in structural proteins between GCRV and mammalian orthoreoviruses (MRV) compared to other members of the family. 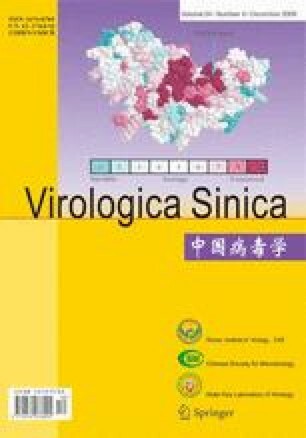 To understand the pathogenesis of GCRV infection, the outer capsid protein VP5, a homology of the μ1 protein of MRV, was expressed in E.coli. It was found that the recombinant VP5 was highly expressed, and the expressed His-tag fusion protein was involved in the formation of the inclusion body. Additionally, specific anti-VP5 serum was prepared from purified protein and western blot demonstrated that the expressed protein was able to bind immunologically to rabbit anti GCRV particle serum and the immunogenicity was determined by ELISA assay. Additional experiments in investigating the functional properties of VP5 will further elucidate the role of the GCRV outer capsid protein VP5 during entry into host cells, and its interaction among viral proteins and host cells during the infection process. Foundation items: National Basic Research Program of China (973 Program) (2009CB118701); National Natural Scientific Foundation of China (30671615, 30871940); Innovation Project of the Chinese Academy of Sciences (KSCX2-YW-N-021) and Science and Technology Foundation of Zhejiang Province (2007C22052).